, one of the most celebrated Protestant divines of the 16th century, was born at Breslau, in Silesia, July 28, 1534. He had already made a considerable progress, for one so young, when he was sent to Wittemberg in 1550, where he studied seven years, and, as his father was not rich, he was assisted by gratuities both private and public, and by the profits of taking pupils. At the same time, he applied himself so closely to study, that he acquired great skill both in poetry, lan-r guages, philosophy, and divinity. Melancthon, who was the ornament of that university, had a particular esteem and friendship for him. 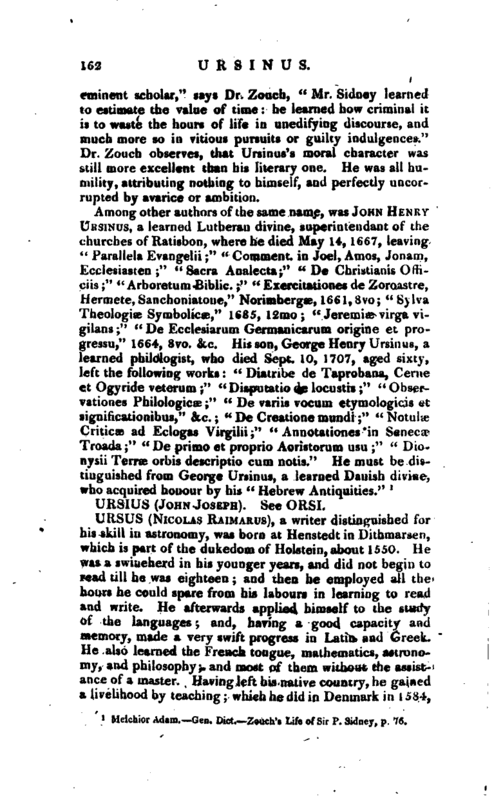 Ursinus accompanied him in 1557 to the conference of Worms, whence he went to Geneva, and afterwards to Paris, where he made some stay, in order to learn French, and improve himself in Hebrew under the learned John Mercerus. He was no sooner returned to Melancthon at Wittemberg, than he received letters from the magistrates of Breslaw in September 1558, offering him the mastership of their great school; and having accepted it, he discharged the duties of his employment | in so laudable a manner, that he might have continued in it as long as he pleased, had he not been prosecuted by the clergy, the instant they perceived he was not a Lutheran. When he explained Melancthon’s book, “De examine ordinandorum ad Ministerium,” he handled the subject of the Lord’s supper in such a manner, as made the demagogues or factious orators (for so the author of his Life calls them) term him Sacramentarian. He wrote, however, a justification of himself, in which he discovered what his opinions were with regard to Baptism and the Lord’s Supper; and when he found that this did not pacify his adversaries, he obtained an honourable leave from the magistrates; and as he could not retire to his master Melancthon, he being dead a little before, in April 1560, he went to Zurich, where Peter Martyr, Bullinger, Simler, Gesner, and some other eminent personages, had a great friendship for him. From this place he was soon removed by the university of Heidelberg, which was in want of an able professor; and in September 1561 was settled in the Collegium Sapientiae (College of Wisdom) to instruct the students. He also attempted to preach, but finding he had not the talents requisite for the pulpit, he laid that aside. 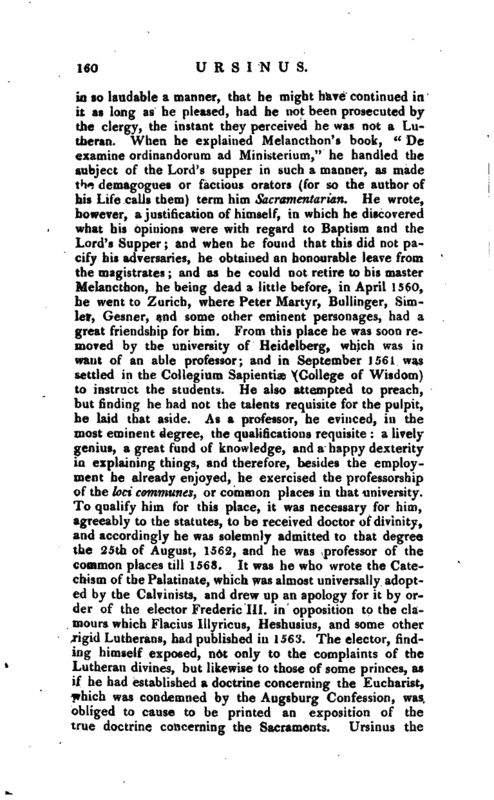 As a professor, he evinced, in the most eminent elegree, the qualifications requisite: a lively genius, a great fund of knowledge, and a happy dexterity in explaining things, and therefore, besides the employment he already enjoyed, he exercised the professorship of the loci communes, or common places in that university. To qualify him for this place, it was necessary for him, agreeably to the statutes, to be received doctor of divinity, and accordingly he was solemnly admitted to that degree the 25th of August, 1562, and he was professor of the common places till 1568. It was he who wrote the Catechism of the Palatinate, which was almost universally adopted by the Calvinists, and drew up an apology for it by ordtr of the elector Frederic III. in opposition to the clamours which Flacius Illyricus, Heshusius, and some other rigid Lutherans, had published in 1563. The elector, finding himself exposed, not only to the complaints of the Lutheran divines, but likewise to those of some princes, as if he had established a doctrine concerning the Eucharist, which was condemned by the Augsburg Confession, was obliged to cause to be printed an exposition of the une doctrine concerning the Sacraments. Ursinus the | following year was at the conference of Maulbrun, where he spoke with great warmth against the doctrine of Ubiquity. He afterwards wrote on that subject, and against some other tenets of the Lutherans. The plan and statutes which he drew up for the elector, for the establishment of some schools, and several other services, raised him so high in his esteem, that finding him resolved to accept of a professorship in divinity at Lausanne in 1571, he wrote a letter to him with his own hand, in which he gave several reasons why it would not be proper for him to accept of that employment. This prince’s death, which happened in 1577, produced a great revolution in the palatinate; prince Lewis, his eldest son, who succeeded him, not permitting any clergyman to be there, unless he was a sound Lutheran; so that Ursinus and the pupils educated by him in the Collegium Sapientiae were obliged to quit it. He retired to Neustadt, to be divinity-professor in the illustrious school which prince Casimir, son to Frederic III. founded there at that time. He began his lectures there the 26th of May, 1578. He also taught logic there in his own apartment; published some books, and was preparing to write several more, when his health, which had been frequently and strongly attacked, occasioned by his incredible application to study, yielded at last to a long sickness, of which he died in Neustadt, the 6th of March, 1583, in the forty-ninth year of his age. His works were collected after his death, by the care of his only son, a minister, and by that of David Pareus and Quirinus Reuterus, his disciples; and to the last of these we are indebted for the publication of them in 1612, 3 vols. folio. Aut agito paucis, aut abi. 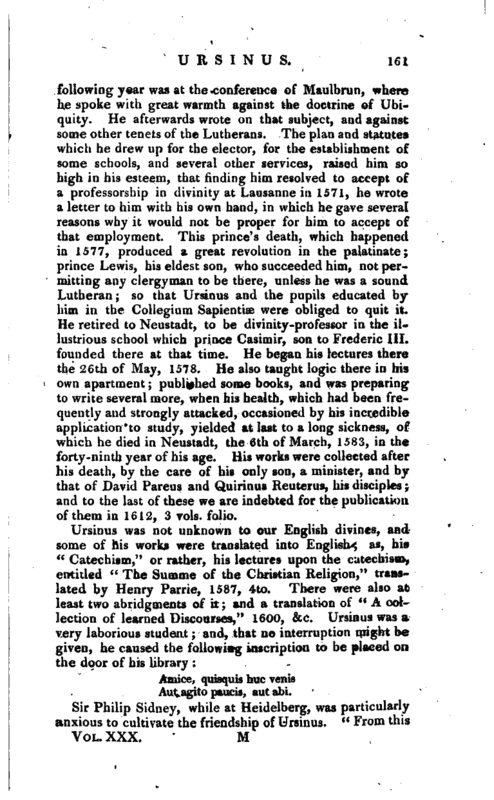 Sir Philip Sidney, while at Heidelberg, was particularly anxious to cultivate the friendship of Ursinus. “From this | eminent scholar,” says Dr. Zouch, “Mr. 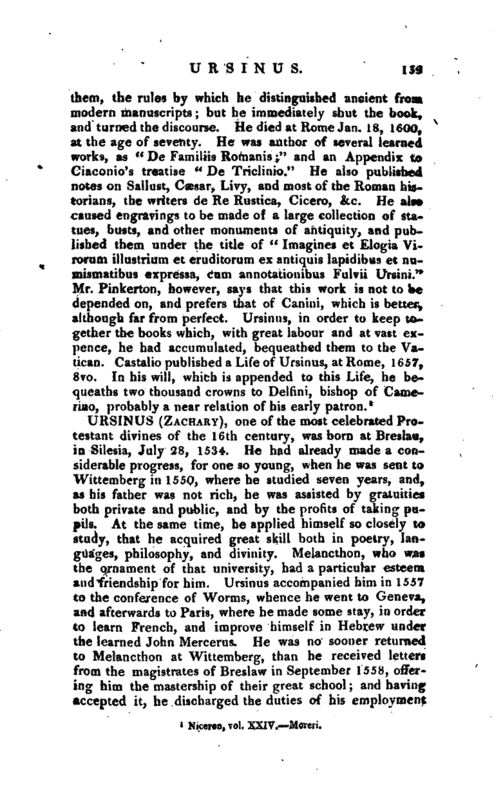 Sidney learned to estimate the value of time: he learned how criminal it is to waste the hours of life in unedifying discourse, and much more so in vitious pursuits or guilty indulgences.” Dr. Zouch observes, that Ursinus’s moral character was still more excellent than his literary one. He was all humility, attributing nothing to himself, and perfectly uncorrupted by avarice or ambition.